Many of us understand and recognize that the brain is the most evolved and complex organ within the human body. It has given Homo sapiens the ability to make conscious decisions, to ponder and contemplate, to create and destroy, to write, to draw, to feel pleasure, to feel pain, to build cities, to send people into space, and to dream. The list is infinite. On that list we also see “to create art” and “to advance in science”. Art and science are two of the most fascinating and influential creations of the human brain, and although they come from the same organ, the brain processes art and science in two separate hemispheres–the right and left. Research tells us that our creative, big-picture thinking is processed by our right brain, while the left hemisphere processes our logical thinking. In this chapter of How to Think Like Leonardo Da Vinci entitled “Arte/Scienza”, we learn how to use these two hemispheres with balance. Many students tend to exercise their left-brain thinking so much that it becomes exhausting. We always seek to arrive at the right answers in the most logical way, and we are rewarded for doing so time and time again. Our thinking has become so systematic that it stifles our ability to express our thoughts creatively and to see things through a more holistic lens. Not sure which side of the brain you utilize the most? Here’s a fun self-assessment included in this chapter of the book that you can do on your own. I am skilled at math. Friends describe me as very articulate. Analysis is one of my strengths. I am organized and disciplined. I read a book starting on page one and go through in order. I am good at brainstorming. I often say or do the unexpected. In school I was better at geometry than algebra. I read a book by skipping around. I prefer to look at the big picture and leave the details to someone else. I often lost track of time. So which side of the brain did Leonardo seem to exercise the most? As you can guess, Da Vinci used both. He would teach his students–artists and scientists alike–to go out in nature to seek out the answers to their questions. He suggested them to examine trees and other flora to understand the way in which life was like a huge network, extending like roots into the ground. He became such a prolific artist and inventor because he found ways to fuse his critical, analytical thinking with his imagination. 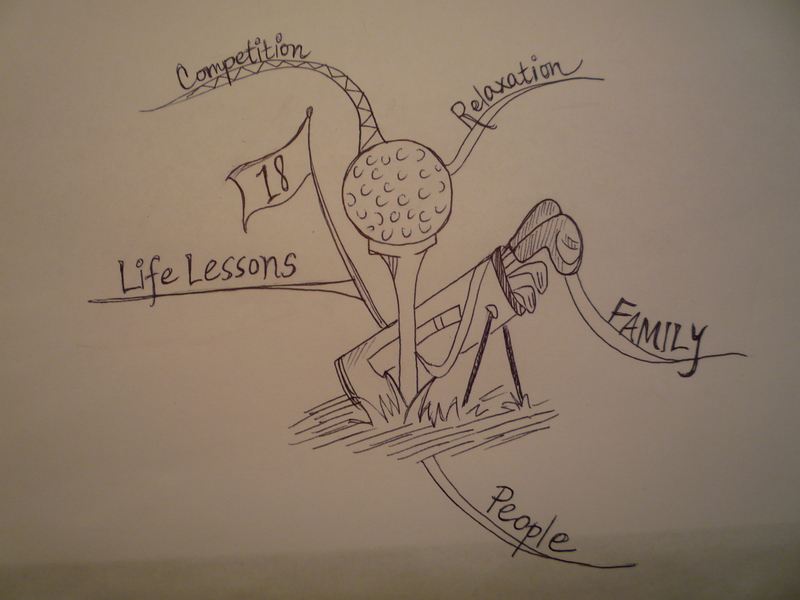 To begin my mind map, I drew some things that I thought best represented the game of golf: the flag of the 18th green, a golf ball, and a bag of clubs. After I finished drawing, I drew lines stemming out from my central picture and wrote down my “key-words”. This process helped me visualize my main thoughts and ideas. Here’s one of my branches entitled “Competition”. More branches. 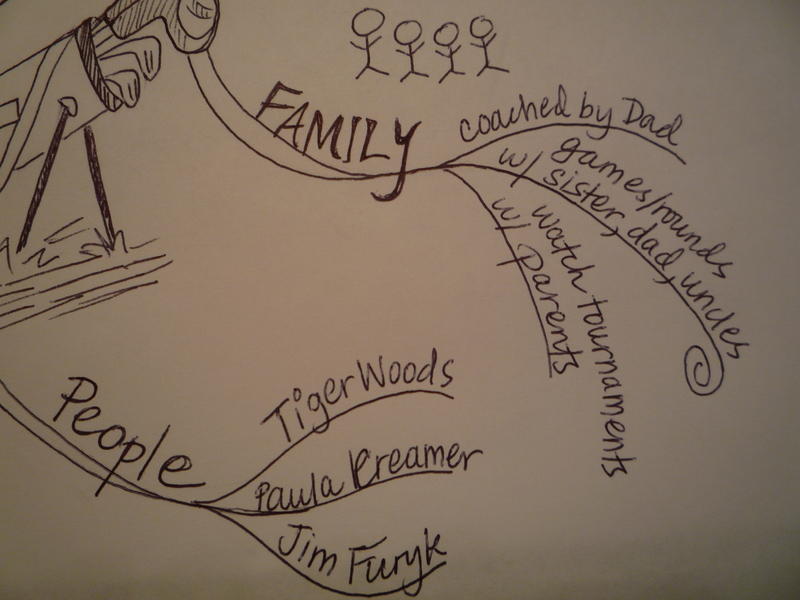 I included “Family” as one of my key-words because golf has been something that has brought my family together over the years. Finish the self-assessment? Learn anything new about yourself? Whether you found out you’re left-brained, right-brained, or a proud operator of both sides of the brain, try this activity from How to Think Like Leonardo Da Vinci for fun! You will need a blank sheet of paper, pens or colored pencils, and a simple idea/memory. The point of this exercise is to free your mind of judgment and exercise both your critical thinking and your imagination. While most of us do outlines in basic bullet point form, this is a more creative way to begin papers or to generate theses. To create a mind map, draw a picture in the center of the sheet of paper that best represents your idea or memory. 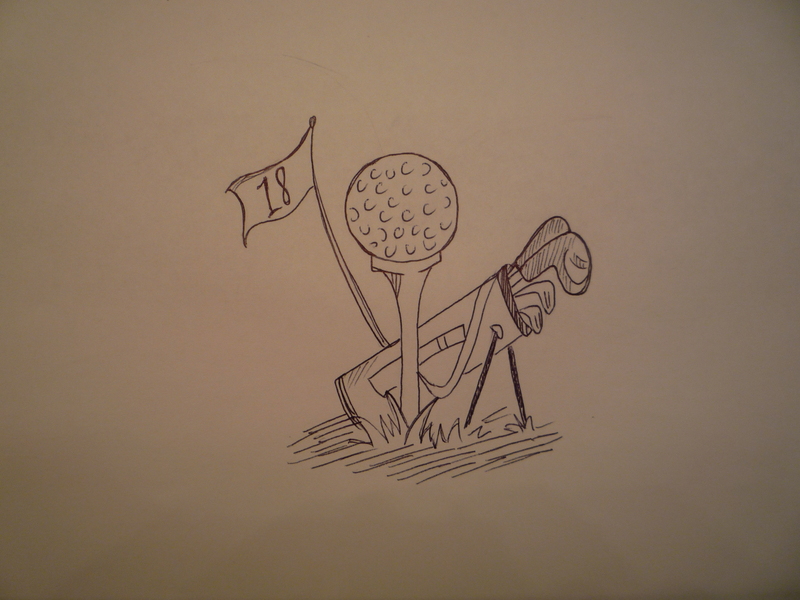 In this case, I chose golf because it was something easy to brainstorm about. 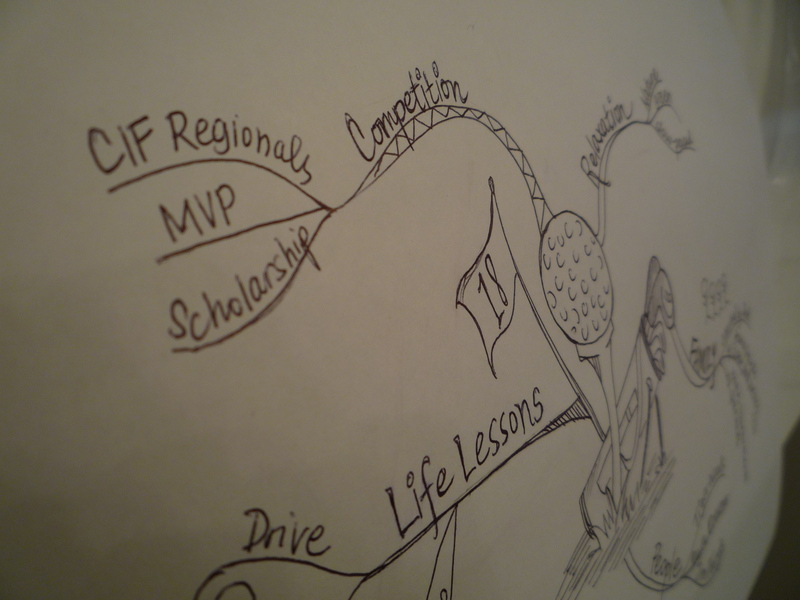 It’s recommended that you create your first mind map on a simple idea or memory. Next, draw a few lines or branches stemming away from your center picture. On these lines, write key-words that best describe or relate to your subject. Remember to print your key-words, since this makes it easier for you to read and remember what you’re writing about. After you’ve written down your key-words, draw more branches stemming from the branches you already established. On these branches you can write down more detailed connections to your central idea. Feel free to doodle other symbols along with these key-words. Remember, we are utilizing both sides of the brain so don’t be afraid of getting creative with this. After you’re all done, you can draw arrows between any of your key-words if you see that connections can be made between them. Color any images you’ve drawn. And that’s your mind map! I hope you will have just as much fun with this activity as I have.